Final recipe! I still can’t believe 70 weeks are passed and 140 recipes has been cooked BY ME!! However I have loved it but like all the nice stuff, it needs to finish! And I wanted to finish it in the best way, with a little cake for me, my 30th birthday, the end of my challenge and the 6 kilos lost! Ok I didn’t win the challenge, but I reached what I wanted: I saw that a total change is possible, that you can loose weight also enjoying food, that I’m strong enough to decide something and reach the end and finally that I can even cook my mum recipes!!! It was an amazing adventure!!! The final recipe needed to be Meringues because it’s one of my favorite sweets and because I tried to do them so many times without any good result, that I need to solve the mystery once for ever! So here is the recipe that finally make me have my fantastic meringues that I use to make a “zuppa inglese meringata”. Ingredients for around 30 meringues of a medium size: 4 eggs white (around 150gr), so 300gr sugar, and a pinch of salt. Then for the cream for the “zuppa inglese” just use: the 4 yolks egg remained, 4 spoons sugar, 2 spoons flour, and 400ml milk. Start preparing your mixer. Put in it the 4 white eggs, a pinch of salt and the turn on the machine. At this point add the sugar little by little and let the machine go for around 30 minutes. Don’t stop until the point that if you place a spoon in it, the spoon will come up with a spongy dense cream that won’t fell. If really never get dense you can add a pinch of flour. Turn on the oven at 140 degree and place some baking foil on the baking pan. Put all the mix in a pipe and create some round meringues.Put them in the oven at 120 degree for around 40 minutes or until you see them get burn underneath. The pass them at a low grill for other 20 minutes and then again on the fire for 40 minutes. In this way they will come a bit colored and crunchy. In the meantime use the other eggs to make this cream; mix the eggs with the sugar and then add the flour and a bit of milk just to made it fluid. Let boil the rest of the milk and then add it to the mix. Put all on a low fire until it gets thicker. When the meringues will be ready, smash one of them in a glass, add the cream and a full meringue on top. Enjoy my meringued zuppa inglese… I think the perfect recipe to close my blog. PS. Mamy vi ho stupito con effetti speciali eh? Non pensavate mi potessero venire eh? E l’abbinamento con la crema?? Vuoi vedere che TILT dopo tutto questo cucinare e’ anche diventata una semi esperta??? Recipe 1: Considering I’m arrived at the end of my challenge, I needed to have a light recipe just to try to reach my target ( ok it’s impossible but why not try) and so the last recipe it’s minestrone. That’s something I always use to eat when my mum does it because is something hot, fullfilling and healty. With a bit of parmesan on top then is delicious! I love also the blended version also called in french ‘potage’. That’s my favourite! It’s always good to have some of it in the fridge and take it out when you don’t really know what to eat. The ingredients my mum uses for 3 people are: a little piece of celery, 2 carrots, 2 courgettes, half onion, a quarter of cabbage, 1 potato, some parsley, a garlic clove, 150 gr beans 130gr chopped tomatoes, 1 stock and water. The process is a bit long but easy: place some olive oil in a pan and hot it up. Then add the finely chopped onion, garlic cloves and parsley. When the onion starts to become goldish, add the peeled tomatoes sauce and the beans already drained by the water. Mix it all and let it cook. In the meantime cut the cabbage in thin slices and then in half again. Add it to the saucepan and pour a good quantity of water. Mix all the ingredients every now and then to avoid them to stick to the bottom of the pan. Wash and cut in cubes the courgettes, the carrots and the potato, and then add them too to the pan. Let it cook for around 20-30 minutes and then have a try to know if it’s missing some salt, pepper or anything else. When the Borlotti are cooked, add the pasta if you want: the right pasta shape for this dish are little tubs but quite thick. Let the pasta cook in the same pan with the soup so the starch released will give taste and thickness to the minestrone. When ready, serve it hot with some grated Parmesan, parsley or simply olive oil if you like it. PS. Mamy il minestrone m’e’ venuto benissimo un po’ piu’ denso e meno verde del tuo, sospetto per la verza che era bella grossa e l’ho usata tutta… ah che bello finalmente posso fare anche io il minestrone qui!!! Come sono contenta! 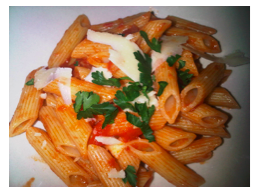 Recipe 2: this is the last and maybe easier recipe of pasta i have to cook. Because so simple i never made it before for guests but after this dinner i have to say it’s a must that need to be in this blog… and it’s really nice too! Ingredients for 4 people: 400gr penne (this shape is a must for this recipe), 300ml of passata of tomato, olive oil, 1 chili, 2 garlic cloves, some parsley, salt and some grated Pecorino cheese. Put some oil in a pan with the garlic cloves in pieces and the chili cut in slices. Let the oil take the taste of these ingredients and when the garlic start to get colored turn of the fire to get the oil inven more tasty. I prefer to take off the garlic after but this depends by your taste. While boiling the pasta(the recipe is quick so you can do both together) add the passata to the pan and let it cook a bit adding some salt if needed. When the pasta is ready toss it in the suace and serve it just adding the chopped parsley and some grated Pecorino! Easy and delicious! Enjoy! PS. Mamy e’ proprio vero, i piatti piu’ semplici sono sempre i migliori. Erano anni che non mangiavo penne all’arrabbiata e devo dire che non deludono mai! Recipe 3: when my mum did this dessert for the first time i was amused by the fact that was so good but not massively heavy. Being based on apple this is the perfect dessert after a quite heavy dinner with lots of courses. Ingredients for 6 people: 1 kg. 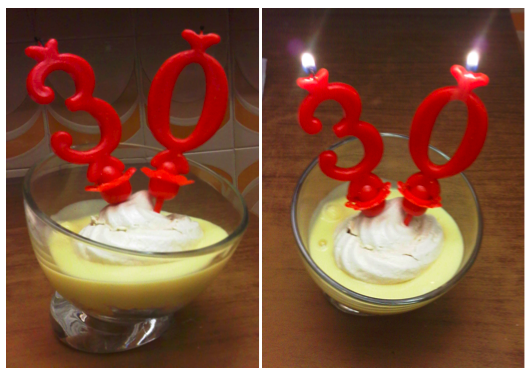 of Golden apples, limon zest, 4ooml whip cream, 100 gr. of sugar. For the Zabaione: 3 eggs, 6 spoons of sugar and 100gr of whip cream, some spoons of Marsala or porto wine and cinnamon. Start the preparation cutting all the apples in little pieces, taking of the skin e put them to cook with 2 spoons of water, some lemon zest and the sugar. Leave it there until soft and keep on mixing until dry but take care to don’t let them stick to the pan. Add some more water if needed. Let them cool down and pass all in a mixer. Then whip the cream and add it to the apple mix to create the mousse. When ready, just place it in the fridge. Now you need to prepare the Zabaione : Mix 3 egg yolks with sugar until creating a creme, add some marsala or porto wine and cook putting the recipient in another saucepan full of hot water and on the fire. We call this way to cook “bagno maria” so the fire is not in direct contact with the ingredients but they get cooked by the hot water. Mix until getting thick and when ready leave it in a side to cool down. Then add the whipped cream and put in the fridge on top of the apple mousse. Serve with some cinnamon on top and enjoy! While the apples mix can be prepared the day before and put it in the fridge, the zabaione need to be prepared the same day that you are going to serve it and placed on top of the mousse and in the fridge. In this way, this recipe it’s perfect when you have guests and you don’t want to spend too much time in the kitchen or fight with the oven! PS. Mamy, questo dessert ha battuto ogni aspettativa…anche da parte mia! a me che non piace molto lo zabaione, il misto con la mousse di mele e’ sembrato meraviglioso. Insomma addirittura meglio di cio’ che ricordassi! Buonissimo…io c’ho pure aggiunto una spruzzata di cannella all fine! Recipe 5: Another famous recipe of my mum, and very common in every italian house is the homemade pesto. What is better than the fresh smell of basil, pine nuts and parmesan all mixed together? And pasta with home made pesto it’s just another thing. My mum never buy the already made, but instead she uses to do pesto and frozen it in little containers to have it for all the winter. Here the ingredients for 5 people: 70 gr. basil, half a glass of Extra Virgin Olive Oil, 2 garlic cloves , 3 spoons of pine nuts, 3 spoons of Parmesan, 1 spoon of Pecorino cheese and a bit of gritty salt. Of course the pasta will be around 500 gr. better if the shape is “trofie”. The procedure is quite easy, but to be traditional, you will need a marble mortar and a wooden pestle. This because instead to chop the leaves you will need to crush them to have the leaves’ oil necessary for the sauce. Wash the basil leaves in cold water and dry them on a paper towel. Don’t squeeze them. Then crush in the mortar the garlic clove the pine nuts and the basil leaves, add the salt, the Parmesan, the Pecorino cheese and keep pounding using a light circular movement of the pestle. Add some of the Extra Virgin Olive from time to time and keep mixing until you obtain a smooth creamy sauce. Pesto should not be greasy and the amount of oil used must be well absorbed and not floating on top. Trofie and Trenette are the pasta used in Liguria, however linguine or spaghetti al dente will make a good companion to this sauce. Just put some sauce in each plate with sme spoon of water from the boiling pasta and mix. In this way the suace will be more creamy and ready to be mixed well with the pasta. Just add a sprinkle of Parmesan on top and Buon Appetito! PS. Mamy che buono! L’ho portato a casa di amici e non sai le facce quando hanno sentito l’odore appena aperta la scatolina! Fantastico e la pasta non ha nulla a che vedere con il pesto pronto! Grazie questa ricetta me la tengo proprio stretta! Recipe 6: It’s a long time I wasn’t eating fresh pasta so last night it came the moment for a classic porcini mushrooms tagliatelle, easy quick and good as usual. Ingredients for 3 people: 50gr dried porcini mushroom and 50-100 gr fresh mashroom, garlic, salt, oil, 300 gr tagliatelle, Parmesan, white wine onion and parsley. Put the dried mushrooms in some warm water and let them there a bit. Then pass them on the fire and let them boil. In the meantime put to boil the water for the tagliatelle. Then drain them keeping their water in a side and place them in a pan with garlic onion oil and some parsley. Then add the fresh mushrooms in slices, some salt and some of the water you put in a side. When evaporated, add the wine and wait for it to evaporate too. Then add some more water if all the mushrooms are not cooked. When the water for the pasta will boil, add the tagliatelle following the time written on the bag. If they are really fresh they won’t take too much. When almost al dente, I added just a bit of milk to the mushroom to make them more creamy, and then I toss in there the tagliatelle as soon as drained. Serve it hot with some chopped parsley and Parmesan cheese. Ps. Quant’era che non mangiavo le tagliatelle? Non mi ricordo proprio piu’! Tu le facevi ogni tanto con i funghi porcini, ma qui sono impossibili da trovare percio’ ho unito secchi con qualche fungo fresco ma ho anche aggiunto troppo rosmarino che dava un po’ un sapore amarognolo. Meglio stare alla ricetta!